Here’s an interesting milestone to talk up around the water cooler: researchers in the Netherlands have created a microscopic storage system that encodes every bit with a single atom — allowing them to fit a kilobyte in a space under 100 nanometers across. That translates to a storage density of about 500 terabits per square inch. For comparison, those 4-terabyte hard drives you can buy today are about 1 terabit per square inch. That’s because, unlike this new system, they use hundreds or thousands of atoms to store a single bit. “In theory, this storage density would allow all books ever created by humans to be written on a single post stamp,” said Sander Otte, lead scientist at Delft University of Technology, in a news release. That doesn’t really give you an idea of how cool this tech is, though. 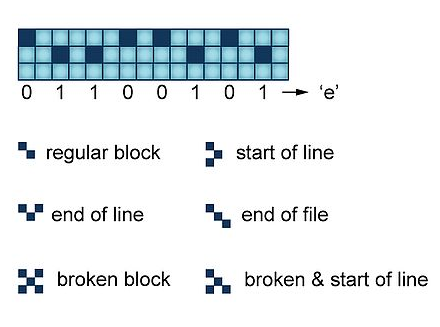 The storage array (“hard drive” isn’t exactly accurate, but gets the point across) is remarkably elegant in its organization — as it has to be if it is going to work at an atomic level. “Every bit consists of two positions on a surface of copper atoms, and one chlorine atom that we can slide back and forth between these two positions,” explained Otte. Because chlorine on copper forms into a perfectly square grid, it’s easy (relatively, anyway) to position and read them. If the chlorine atom is up top, that’s a 1; if it’s at the bottom, that’s a 0. Put 8 chlorine atoms in a row and they form a byte. Then there are a few special marks that indicate things like the end of a line or file, or that the next space should be ignored (in case of damage, for instance). 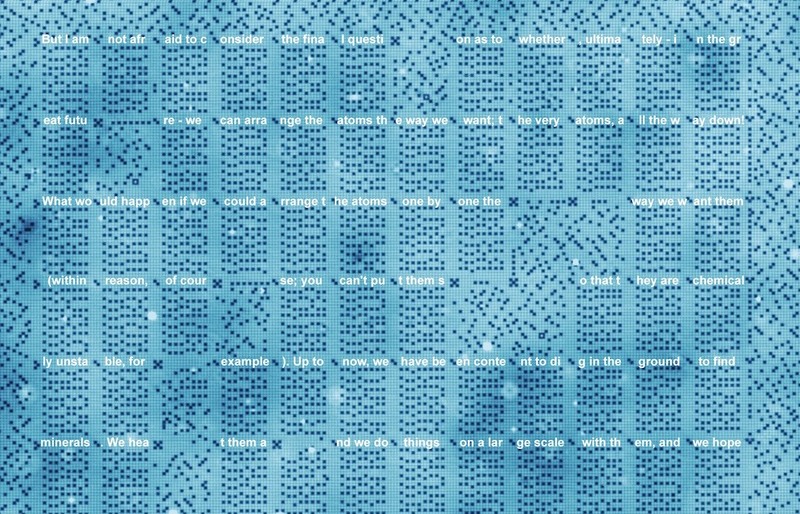 Altogether the system is efficient enough that they were able to store hundreds of letters into a 96×128 nanometer space (12 rows and 12 columns, each cell holding 8 bytes). And it’s easy enough to do these manipulations that the process can be automated. This is strictly lab-bound, though, at least for now. The chlorine-copper array is only stable in a clean vacuum and at 77 kelvin — about the temperature of liquid nitrogen. Anything past that and heat will disrupt the organization of the atoms. It’s early-stage research, but still promising. 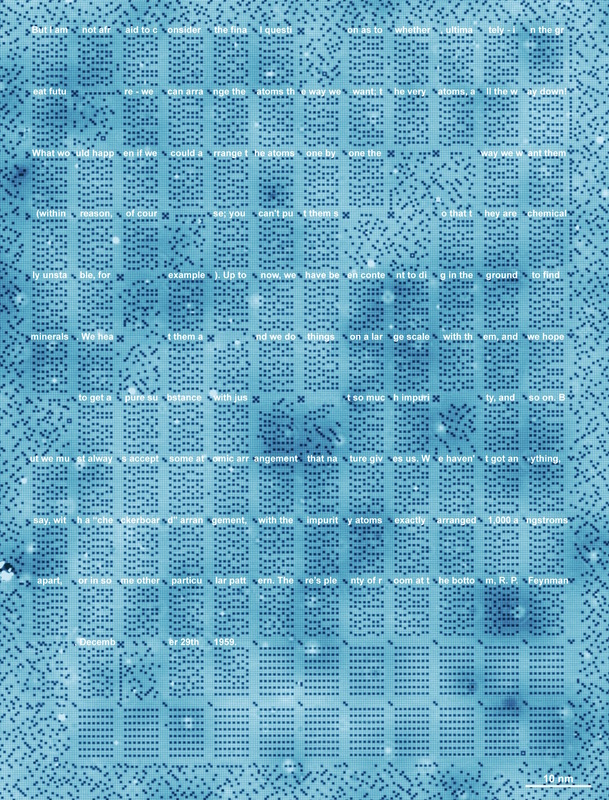 The idea of using individual atoms as bit storage is something many scientists have dreamed of, and the applications of such dense storage are, of course, innumerable. The research was published today in the journal Nature Nanotechnology.